TerraMax Pro Hip and Joint is a liquid supplement that aids in quick healing within young and elderly dogs. It aids is preventing arthritis as dogs age. Great for big and small dogs. Liquid supplement allows for quicker absorption and effectiveness. Many customers report quick recovery for their younger and elderly dogs with arthritis and joint related injuries. Due to the all natural ingredients, side effects are a rare occurrence. Absorbs into the body relatively quickly. Has a higher dosage to ensure top-notch health. Minor side effect includes dizziness and diarrhea but is a rare occurrence. A bit pricier than other supplements. Even though TerraMax Pro Hip and Joint is on the pricier side, due to its natural ingredients and potent dosage it remains a good investment. We noticed most dogs take a liking to the supplement and even prefer their food to have TerraMax in it. While there are other supplements out in the market, this liquid all natural supplement has a benefit of being tasty and quick acting to dogs of all ages and sizes. As your dog ages, it's natural that their joints will age with them. However, slowing down the aging process can be achieved by giving them the right nutrients. Terramax Pro Hip and Joint Supplement aims to help your dog experience less discomfort and pain as your dog ages. It also aims to improve joint health as well as general health. 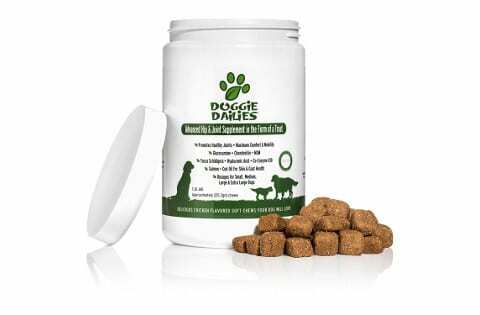 With the liquid supplement ensuring that your dog's body absorbs the nutrients, your dog will get faster results. What is TerraMax Pro Hip and Joint? Terramax Pro Hip and Joint is a liquid formula that contains Glucosamine, Chondroitin and Opti-MSM. These natural ingredients help strengthen joints and connective tissues so your dog can continue being as active as it was when it was younger. This formula not only improves joints and connective tissues but also helps with inflammation and stomach issues as added benefit. Because TerraMax Pro is confident in its purified and distilled formula, they offer a money back guarantee if the supplement doesn't work to your liking. What Kind of Formula Does TerraMax Pro Hip and Joint Use? Terramax Pro Hip and Joint is a liquid formula. Liquid formulas have a tendency to absorb quickly into the body, which means it acts quickly and more reliable than capsules. Using a liquid formula also makes it easier to add to your dog's food or water. Making it easy for you to administer to your dog. The main ingredients that help dogs in the formula are Glucosamine, Chondroitin and Opti-MSM. Each of these ingredients improves the overall health of the dog and also aids in rebuilding the cartilage and joint tissue. How Does TerraMax Pro Hip and Joint Work? Terramax Pro Hip and Joint works by using Glucosamine, Chondroitin and Opti-MSM. 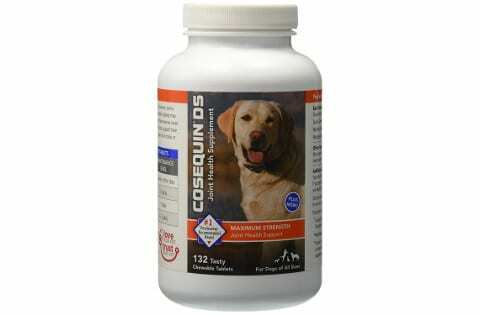 Glucosamine helps by rebuilding cartilage and acts as an anti-inflammatory to reduce any of your dog's pains. It also improves lubrication within your dog's joints and rarely has side effects. MSM is a cell rejuvenator, which promotes tissue growth as well as repairs broken skin. It also serves as a joint healer, it can help prevent arthritis as well as slowing it down. With these three main ingredients combined, it makes for a supplement that not only helps repair joints but also improves the overall health of a dog. This includes their skin and preventing any pain in your dog from growing older. Reduces any inflammation your dog has. Repairs broken tissues in your dog. Helps prevent arthritis in your dog. Helps your dog recover quickly from any injuries that may occur. Due to the formula, it's a fast acting liquid supplement. Easy to add to your dog's food or water. Can be used on adult dogs long before they become seniors. There is 50% more Chondroitin, 62% more Glucosamine than other formulas and Opti-MSM, which has greater sensitivity than regular MSM. While it is really uncommon as the ingredients are natural, rare side effects do include vomiting or diarrhea. However these side effects can be reduced by lowering the dosage of the supplement when you administer it to your dog. Before starting your dog on any supplement or medicine, be sure to seek veterinarian advice. 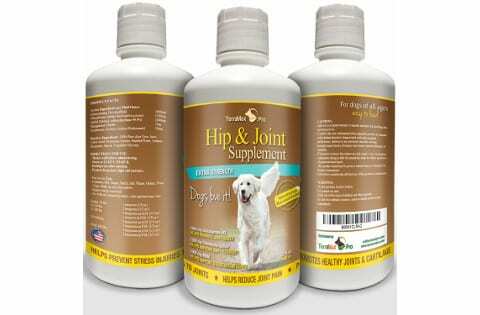 Helps prevent arthritis in older dogs and promotes quicker healing. Comes in a liquid formula ensuring quicker results. Product is manufactured in a FDA and cGMP (Good Manufacturing Practices) certified facility. A small percentage of dogs may have minor side effects. This product uses Glucosamine, Chondroitin and Opti-MSM as its active ingredients. It also has manganese chelate, which provides extra vitamins in the supplement and hyaluronic acid, which binds to the glucosamine. The inactive ingredients are aloe vera juice, citric acid, purified water, stevia, vegetable glycerin, potassium sorbate and sodium benzoate. All of which are natural ingredients and add nutritional value to the supplement. TerraMax Pro ensures that there is no sugar, salt, starch or any other refined products used in their supplement. This ensures the highest quality of nutrients for your dog. The recommended dosage of TerraMax Pro hip and joint varies depending on the weight of your dog. Smaller dogs under ten pounds will need 1 teaspoon, for a dog between 10 to 24 pounds, 2 teaspoons for the day will be enough. A dog that weighs between 25-49 pounds 2 teaspoons in the morning and 1 teaspoon in the evening. Dogs that weigh between 50-100 pounds should have 2 teaspoons in the day and evening. And dogs over 100 pounds need 3 teaspoons in the morning and evening. For dogs that might react adversely to the supplement, make sure to lower the dosage. This supplement can help aid in healing injuries that a dog may have had or future injuries. This product however cannot cure or treat any illnesses. One customer said their dog had a minor injury so he needed an additional supplement. Soon after the initial phase of getting him used to the formula, he now won't eat his food without it. Another customer said while their dog was on another supplement, that it wore off once winter came around. However with Terramax, now their dog is active all year around and healthier than ever despite being 11 years old. Another customer said that the formula worked rather quickly and made their dog healthier. But one con, the customer pointed out was that it was pricy but worth the money as it helped immensely. Most customers said their dogs enjoyed the taste of the supplements. They also said their dogs were healthier from injuries to surgeries to aging pains. Some alternatives to TerraMax Pro Hip and Joint are Nutramax Cosequin DS Plus with MSM Chewable Tablets, Vetri-Science Laboratories Glyco-Flex III Bite-Sized Dog Chews and Doggie Dailies Advanced Hip & Joint Supplement for Dogs. Nutramax Cosequin DS Plus with MSM Chewable Tablets differs from TerraMax Pro as its concentration is different. Cosequin DS Plus MSM contains 600 mg Glucosamine, 300 mg Chondroitin Sulfate and 250 mg MSM. Nutramax Cosequin contains a lesser dosage compared to TerraMax Pro and is in tablet form. People with older dogs tend to prefer this supplement over others. This has a lower dosage compared to TerraMax Pro. It's in a chewable tablet form and would act slower than liquid. More affordable than TerraMax Pro. Has been studied for a long period of time to prove its effectiveness. If you would like to know more then check out our Cosequin review. 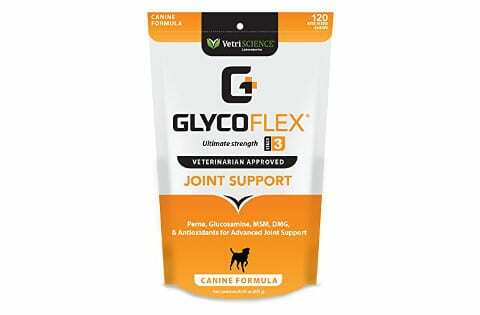 Vetri-Science Laboratories Glyco-Flex III Bite Sized Chews differs from TerraMax Pro in that it contains 100mg Glucosamine, 100 mg MSM 50mg, Chondroitin Sulfate 50mg, Yucca 10mg, CoEnzyme Q10 10mg, 10mg Hyaluronic Acid. It uses additional ingredients such as Yucca and a CoEnzyme. It also uses inactive ingredients such as rice, chicken, and salmon oil to name a few. This adds more flavor to the mixture making it more of a treat for dogs and is easy to chew for them. Uses more ingredients than TerraMax Pro. It's one of the few brands that isn't beef based in case a dog has a beef allergy. Acts more as a treat than a supplement. This product is a chewable tablet made of glucosamine, MSM and perna, manganese, vitamin C and glutathione. It also is naturally flavored by real chicken. This treat is great for those who have elderly dogs showing ages of orthopedic illnesses. While it is cheaper than TerraMax Pro, it does have a strong scent to it. Tablets have a chicken flavor. Recommended for mild to moderate arthritis in dogs. Some ingredients are not natural compared to other supplements. If your dog is young and active, it might gain injuries due to their playful nature. However, with TerraMax Pro the injuries and pain don't have to last a long time. TerraMax Pro is also great for elderly dogs as well, as it helps with relieving any pain their joints might have as they age. It also serves as a preventative measure to arthritis. Overall, TerraMax Pro is a great natural supplement that absorbs and works quickly due to the liquid formula. As well as being a treat dogs tend to love.